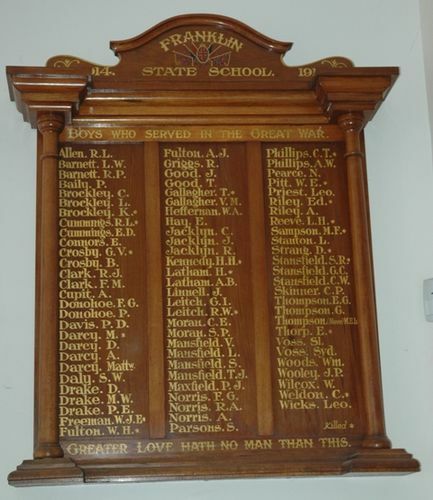 Franklin State School Roll of Honour commemorates those who served in World War One. This afternoon , the Honor Roll of the Franklin State school on which are inscribed the names of all former pupils of the school who enlisted for the Great War was unveiled by the Warden of Huon, Cr V. Skinner. There was a very large attendance of parents, scholars and friends. Cr. D. E. Ryan, one of the members of the Franklin ward presided and other speakers were Rev. Stuart Williams and Rev. S. Roberts. As the Union Jack was withdrawn from the Honor Roll, which is a very handsome specimen of woodwork, the scholars sang 'Lest We Forget,' and Bandmaster W. Vincent played the Last Post. Subsequently the children sang very creditably a number of school songs under the conductorship of the headmaster, Mr. A. W. Howard. Prizes were awarded to a number of children for regular attendance during the year (five of them having attended every day during the past school year) good progress, conduct and general school work. Huon Times (Franklin, Tas), 22 December 1925.